CRUNCH TIME: With Local Government having experienced cuts of 40 per cent in their funding, many are looking at the stark choices left and saying ‘enough is enough. I WRITE ahead of a Full Council meeting at which your councillors will – or at least certainly should – feel a huge weight of responsibility. As austerity cuts continue we must proceed tonight with proposals towards reducing service budgets by £35 million for the financial year 2015/6. To put that amount into context it’s more than we spend on waste collection, street cleaning, libraries, youth services, leisure centres and community centres – and that’s because, of course, most of the council’s budget is spent on older people and vulnerable children. We will get through this round and then we still have a further £25m to cut in the following financial year. Unless it is somehow agreed that all those services people ‘see’ can go completely – and that’s never going to happen – we will simply have no choice but to reduce services for older people and vulnerable children too. Some of that can be managed. In fact, we’ve been doing that for a long time already: let’s not forget that £141m has already been culled from our budgets in the past few years. But when you couple these cuts with the increased demand for these kind of services – which is mainly because older people are living longer and requiring more home and social care – the numbers simply just don’t add up. In our quest to meet these financial challenges the easy savings have now gone and we all need to prepare ourselves for what is to come when we’re at this point in the budget cycle again next year. Unless there is a change of Government and one that has a different policy on public sector cuts, or unless the current administration realises things just can’t continue on this trajectory, then I fear that the very fabric of public services will be tested to destruction. This isn’t an argument about whether public expenditure should be cut to help reduce the deficit. The truth is that the deficit has actually increased despite Local Government experiencing cuts of 40 per cent (which is £10 billion). The increase in the state’s welfare bill isn’t because more people are sat at home, it’s because the economic ‘recovery’ is weak. Although more people are in work the type and quality of that work is poor. They have less job security, less money and ultimately that means more public money needs to be spent on ‘in work’ benefits. The same is true of the National Health Service. If prevention is better than a cure then we need to look more seriously at the state we are in. Community services and social care are being reduced and, of course, this just adds to the queues at A&E. It is also more expensive and it fails those people who want to stay at home and be supported. All political parties talk about public service reform but the reality is that only local government has had any sense of urgency about it. With money coming out of the system so quickly, if we don’t modernise, become as efficient as we should be – and remove duplication – then, believe me, you, your family and neighbours would have already noticed the cuts a lot sooner. Perhaps if we did as a sector what others do, and failed to change quickly enough and simply defend our own interests ahead of the public interest, then maybe Government would come and bail us out? All this drives poor behaviour and councils the length and breadth of the country are now saying ‘enough is enough’. We are in a very real danger now of foolhardy and dogmatic policy of ‘slash and burn’ and to hell with the consequences. We aren’t interested in managing decline in Oldham. We believe the best way to recover is to invest in growth. Our solution is to have more people in work paying taxes with public services reformed across all bodies to get the best possible value. We are investing in growth because it will mean more businesses paying business rates and more homes paying more Council Tax. With the current pipeline of projects we expect that an additional £3 million of new income will come in to help fund council services in the future. We are also making wise investments. The collective decision to invest in expanding the Manchester Airport Group has seen an additional dividend of £1m to fund our services this year, on top of the £1.4m we’ve already received. 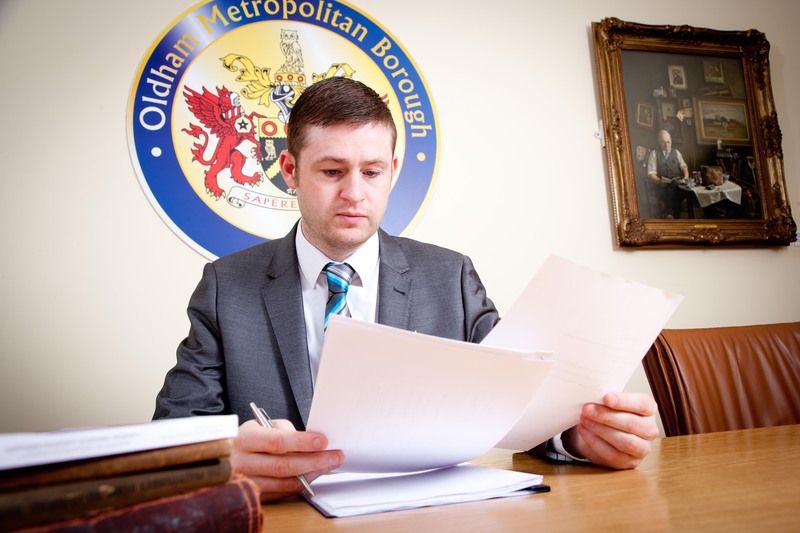 We’ve also bought buildings in Oldham town centre at the bottom of the market to bring them back into use. With the major regeneration projects and the new Independent Quarter we’re already seeing growing demand now that will give the town a healthy return on that investment. In many ways all this feels like ‘old news’ because we’ve been talking about cuts for a long time now. But the difference now is that councils are saying the cuts have gone as far as they can without very significantly changing the fabric of public services in our town and others. At tonight’s meeting, aside from the budget proposals, we’ll also be debating the proposals to introduce a Greater Manchester Mayor. I’ve made my views about the imposition of a Mayor clear. I’m quite relaxed about the principle, but I didn’t feel Government should have made it a condition of devolution. If we believe in having a Mayor, then surely we should make the case to the public and win support for it. However, we also have a decision to make. Do we accept the deal as it stands? It’s not a great deal but it’s the deal offered on devolution of powers from Government to our area and we need to take it. It’ll be for us to then make it work, though, and we will have to pedal hard to do that. But I am also keen to see transparency in the way these new arrangements are funded. Either Central Government will give additional cash for it or, as I suspect, each of the ten councils will be asked to fund it from their ever-diminishing budgets. The Manchester Evening News has dubbed that a ‘Mayor Tax’ which is headline-grabbing but it misses some important points. The first is that public services are predominately paid through taxation, so it is no more a ‘Mayor Tax’ than we have a ‘Libraries Tax’, or a ‘Street cleaning Tax’. We just call Council Tax what we do because it is delivered by a council. The second – and probably most important point – is that Greater Manchester taxpayers already fund a great deal of activity. You’ll see some of it already on your Council Tax bill with the Police and Fire precepts. We also pay a levy to fund Transport and Waste Disposal and contribute to other services across GM that you may not even be aware of. In total Oldhamers paid £18m for services and functions across GM in this financial year, so it’s absolutely right that the Mayor, or even the Combined Authority, are crystal clear about how much is being passed on. If you want to call that a “Mayor Tax”, that’s fine, but let’s not pretend it’s something new or unreasonable. This is my final blog before the festive break, so I’d like to take this opportunity to urge you – in those frantic final shopping days – to remember to ‘Shop Local’ and spend your cash in Oldham and your district centres. Above all I hope you all have a fantastic Christmas with your family and friends. Shocking what you have voted to do the Youth Service. Agree with all you say .Just one point or query can say How you may have to make the cuts on the old folk if Cameron and his Guv God forbid are back next year . Rather than “prepare ourselves for what is to come”, perhaps now is the time for each and every one of us to ditch the manipulated sense of powerlessness that serves the controlling-elite so well, and start to recognise our true, inner potential for realising meaningful change in the world. This is our town, our country, our world. Why should we (those picking crumbs dropped from the top table) just sit back and take this insufferable madness? Get off your knees, come together and make a stand.